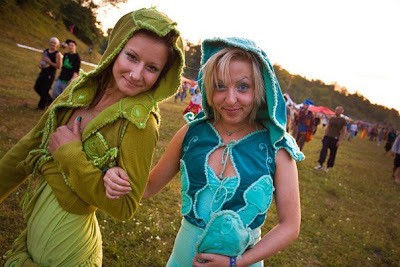 This August, celebrating ten years since the original event, psytrance freaks swept into the field of dreams known as the Ozora Festival, the international psychedelic trance event in Hungary. 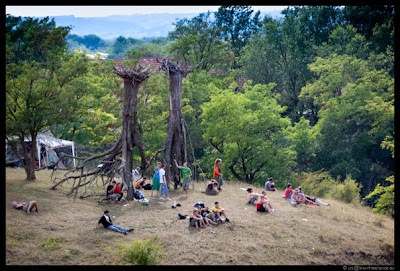 The organisers and their friends know how to hold a party, with a great venue and production qualities satisfying the large numbers of participants descending on this green farm site near the town of Ozora a couple of hours out of Budapest, surely one of Europe’s most charming cities. It was one of the best psychedelic trance line-ups to date. 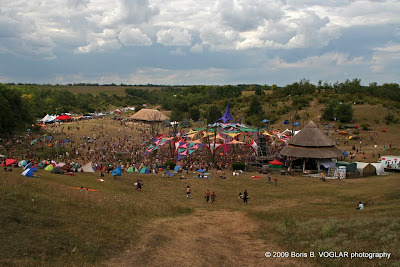 Over 15,000 freaks assembled to board the Ozora Mothership. But it wasn’t a smooth abduction. In fact, at the gate on Monday night, and well into the Tuesday morning, the event’s first night, the freaks were freaking out. And for good reason, as we were set an outrageous endurance test. On that night, emptied out of our rides, we faced a failed ticket verification system and an avoidable crush lasting for over 12 hours. Avoidable, since organisers knew 5000 had bought tickets and should have implemented an appropriate entrance strategy (and back up plan). Instead, the gate held all the appearances of the entrance to a refugee camp. 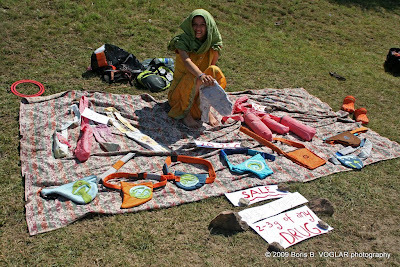 As a wide river of ticket-holders were funnelled through the eye of needle (one ticket stall!) they were confronted with nothing short of massive incompetence - of the kind that some event industries can apparently walk away with since, as cynical minds aver, the goodwill of participants is being exploited. Many other types of event would have seen rioting. With thousands corralled in a structure resembling a livestock race, we were like sheep edging towards the slaughterhouse. It was especially dispiriting for those like myself and my fellow travellers who had journeyed great distances from other continents. With the prospect of standing in the queue for over ten hours, many, like myself, were forced to buy another ticket so they could avoid the trauma. 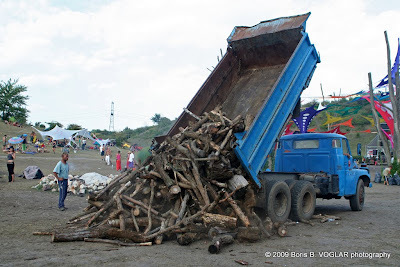 The ordeals of gate entry at large psytrance festivals have grown onerous in the last years. It might be said that ordeals are implicit to a pilgrimage or similar type experience, but this is a commercial event and those who are taking the money owe to ticket holders a responsible and humane entrance strategy (all this said, the ticketing agency Access All Areas refunded my ticket, and Amin from AAA writes to me that Ozora are determined not to ever repeat this situation). 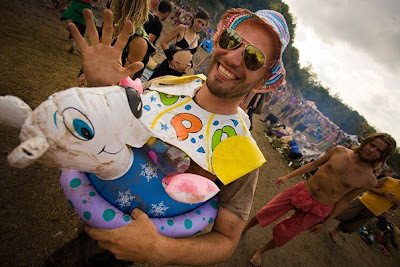 It’s clear that the event line-up was Ozora’s main dedication. And who can complain about that. It was quite simply spectacular, giving cause for many black sheep to develop amnesia over the entrance trauma, and graze in the field of dreams over seven days - shuffling out to Liquid Soul, Vibrasphere, Echotek, Son Kite, Tristan, Hallucinogen, and Blue Planet Corporation among a litany of young and old hands: from Etnica, Total Eclipse, to Hyper Frequencies to Neuromotor and Martin Freeland (aka Man with No Name), who demolished the main floor with his killer final set. Not open to camping, this sheltered arena was open to sheep shepherded by a donkey across the surrounding fields. The cove held a pagan-like appearance, with the circumference of the dance floor marked by a ring of giant dead trees “planted” in place. At the back of the dance floor there was a huge fire burning each night following the daily restocking. And on the summit overlooking the stage at the far end of the field there stood two wicker-like figures formed from trees and frozen in dance, a DNA spiral positioned between them. 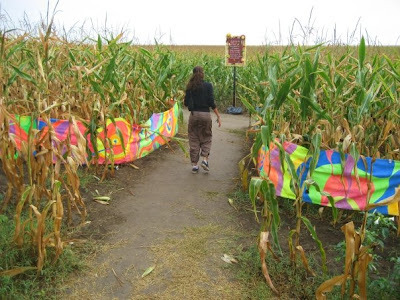 And on the heights to the left of field a cornfield was the context for a labyrinth. 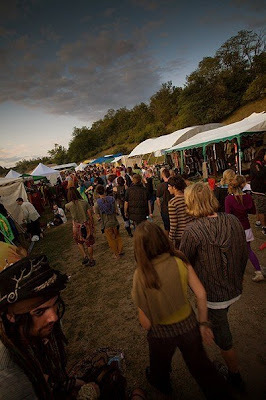 Given that you had to negotiate Ozora’s main thoroughfare, a thin valley trail lined with psy-fashion boutiques and instant freak merchants, arriving at the main floor was like locating the supermarket in a mega-plex, where the goal can only be achieved once you’ve passed hundreds of specialist shops and distractions. This aspect was also a little disturbing – the pressures of fashion and “things” becoming too much for those bereft of the hat and the horse. Perhaps it's due to the alternative pretentions of festivals like Ozora that such commoditising stands out for criticism. Many festival-goers have long sought the confines of these events as a safe harbour from the possessive power of commodities. Still, these were mostly small-scale traders and craft-sellers, and there was no advertising hoardings or brand campaigning on site. But it was most certainly worth one's while negotiating the last bend of the market alley, passing the chaishop and into Ozora cove, for you were broadsided by a superior audio-visual experience. 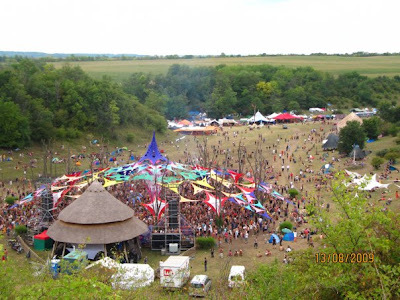 The Ozora dance floor was a focal point unparalleled in many psytrance festivals where the energy is distributed across multiple stages. The only other key venue (besides a small cinema with sound system) was the Chill out tent, where the likes of Aes Dana, Chill in Berlin, Entheogenic, Vibrasphere and Ott performed in a noctilucent galaxy. 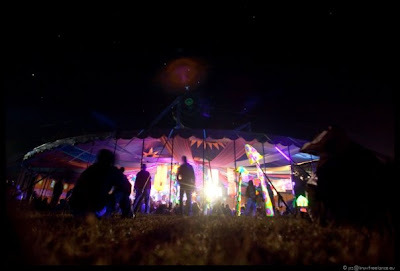 The Chill featured quality sound production and became the venue for the after party which continued right through to midday Monday, with a renegade system running in a tepee down the valley. 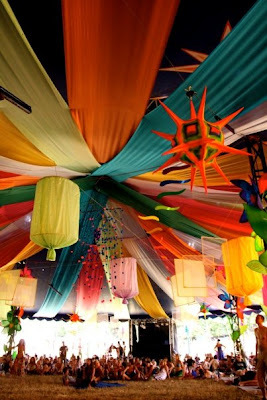 But the main stage was an extraordinary venue with a dedication to the psychedelic progression. That is, progressive electro trajectories during many of the days accept the last when a distinct progressive psychedelia held the day, from Prometheus at 3am, through Protoculture and onwards through Digicult, Blue Planet Corporation to Shane Gobi and Man With No Name (among others). 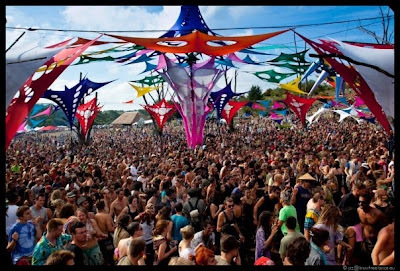 This Footage screened on local TV gives you a good idea of what was going down at Ozora. Besides the gate fiasco, and the implicit problem with having one individual (namely the owner of the farmland at Ozora) capitalise on the experience, this was a memorable addition to a now ten-year tradition. 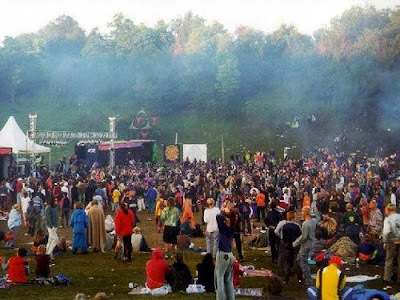 The Solipse Festival, held on this site in 1999 with 20,000 people celebrating the total solar eclipse, was instrumental in the development of post-Goa trance culture (a compilation was released before that festival: Solipse - The Full Solar Eclipse Festival Compilation ). 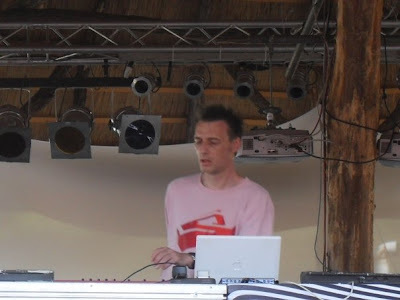 Etnica, who performed at that event, were called back for the 2009 anniversary along with many others who have played at Ozora over the years. 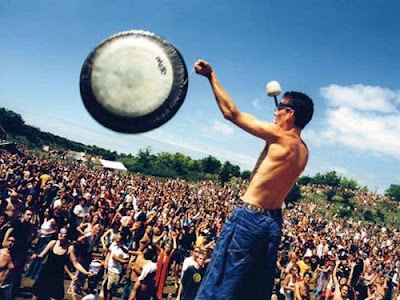 Solipse 1999 was likely the most popular and formative event in psytrance at that time, cementing the association between psytrance and the total solar eclipse, the musical with the cosmic event. 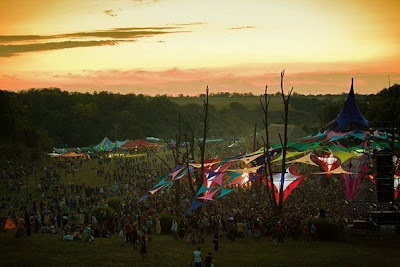 Though with different people participating in the event-organisation since the initial festival, each Ozora festival has carried the spirit of the initial experience, which for many participants holds a spiritual appeal. 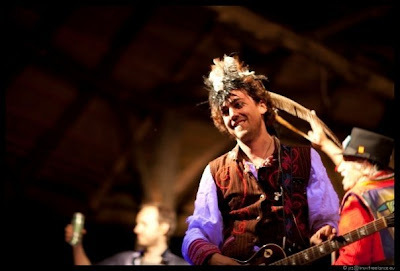 Other acts performing at Ozora 09, including Shpongle, Hallucinogen and Total Eclipse, have all had significant involvement with total solar eclipse event productions and performances. In this way, Ozora 09 was quite a retrospective, with Shpongle headlining in a live performance on Saturday night. 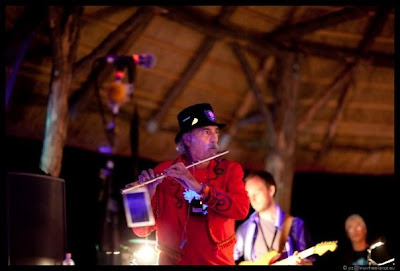 With 12 performers on stage, it was a rare live performance from the act formed by Simon Posford and Raja Ram in the mid 1990s following their witnessing of a total solar eclipse in India in 1996 (an experience which gave life to their ethnodelic “…And the Day Turned to Night” (the closing epic on their debut Are You Shpongled?). It’s possibly the only time when you’ll see people applauding the sky. The perfect yet brief marriage of the sun and moon. 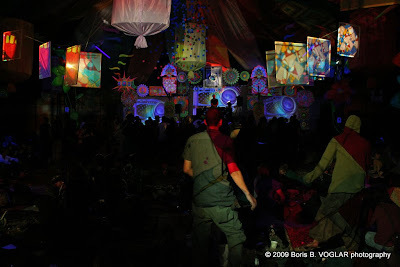 The spirit of totality birthing Ozora had been building for a few years prior to that event. By all accounts, the first “eclipse rave” was held near the coastal city of Arica at the edge of the Atacama desert, Chile, on November 2nd and 3rd 1994. Held in the immediate years of transition from Pinochet, that event was organised chiefly through a Chilean-German partnership, and was sponsored by outfitters Pash and filmed by MTV. The event featured Derrick May and for the first time in his homeland, Ricardo Villalobos. Eclipse chasing has a long and interesting history that would inevitably merge with psychedelic culture. The experience of totality associated with a total eclipse of the sun, has historically been a cause for celebration and/or alarm, and interpreted according to local cosmological systems. Scientists have shown great interest in total solar eclipses since the eighteenth century but it was in 1836 that solar physicist Francis Bailey had founded the industry of eclipse chasing at the same time as generating fervor for solar physics. From that period populations were known to travel from locations outside the line of totality to view the spectacle, with multinational scientific expeditions mounted over the next century. Eclipse chasing would eventually become a recreational pursuit with the interventions of the Pedas-Sigler family of educators who, from the early 1970s, initiated eclipse tourism on board cruise ships. These entrepreneurs had, in fact, attempted to stage a rock festival (“Eclipse ‘70” in March 1970), in the line of the moon’s shadow in 1970 in a tiny fishing village in Suffolk, Virginia, called Eclipse (so named after a total eclipse there in 1900). But the proposed event was opposed by the townsfolk who condemned the potential “freak-out” on their turf only months after Woodstock. This might have been the greatest party that never happened. However, instead, on July 10 1972 they undertook their “Voyage to Darkness” cruise off the north Atlantic coast of Canada. Mixing science with sociality, it was beginning of a great adventure - they've been holding eclipse cruises ever since. These eclipse tours demonstrated that it was not only subscribers to Sky and Telescope that were gravitating to remote regions where shadow bands race across the Earth. Since the early 1970s, the 100 mile wide shadow has drawn many into its path. Later maven of integrative medicine, Andrew Weil exemplified the psychonaut drawn to the marriage of the sun and the moon, the HierosGamos from which he would draw considerable psychocultural significance, as explained in his Marriage of the Sun and Moon: A Quest for Unity in Consciousness (Houghton Mifflin 1980: 222) where he describes his experience of an eclipse in Miahuatlán, Oaxaca, Mexico, in March 1970. But, with the failure of Ted Pedas to draw the eclipse into the orbit of the counterculture in that same year, and having aborted the dance music eclipse festival idea for lunar liner cruises, with the aid of cheaper travel, electronic music technologies and the Internet, it would take another 25-30 years for the dance music festal eclipse event to materialise. By the late 1990s, as a cavalcade of spiritualists, astrologers and psychedelic big-game hunters found themselves in the playing fields of the HierosGamos, scientists and hippies found themselves proximate to one another in social spatio-temporal scenarios (ie parties) planned according to the alignment of celestial spheres at sites anticipated as optimum observation points on the line of totality. Curiously scientists and hippies would share a moniker – “freaks”, referencing the collision of travel, adventure and curiosity in a shared cosmic experience. 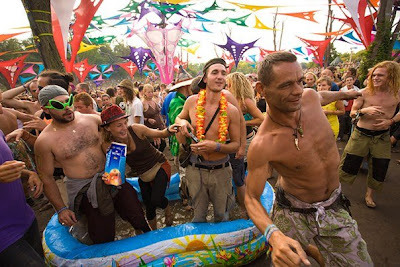 But it would be the psytrance orientated festivals where, despite the growing presence of those determined to record the experience using photographic equipment, which accommodates those who implicitly recognise that a total solar eclipse is not merely a “cosmic event” to observe remotely, but a wild social experience in which one was immersed totally. Like a dozen turns of the New Year celebrated simultaneoulsy, the alignments would affect a licentious atmosphere among the crowds gathering in the totality. So, as cosmic cowboys, prophets and prospectors joined the hunt, a whole new social event came into being as a highly specialised traveller phenomenon. 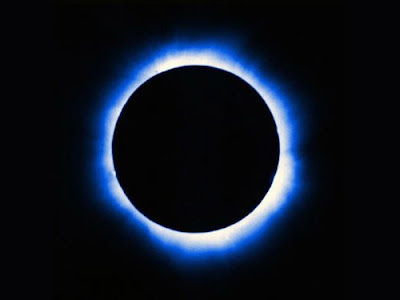 Following the Eclipse Rave in Chile, Solar Eclipse Festivals subsequently attracted travellers to events in Siberia, Venezuela/Columbia, and South Asia in the late 1990s. 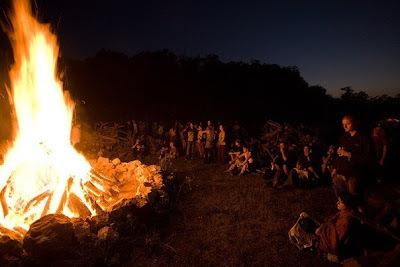 There was another Solipse festival in June 2001 in South Africa and in early December 2002 there were festivals mounted on the path of totality near Lindhurst, South Australia (Outback Eclipse) and in South Africa. By that time, these events had accumulated a large following which was observed in 2006 at Soulclipse in Southern Turkey. Recently there have been smaller events in Siberia and Japan with another significant festal-cosmic event juncture planned for Easter Island in July 2010 with the Honu Eclipse and then beyond that, near Cairns, Australia, in November 2012. In his memoirs, the research scientist Francis Bailey wrote of his total eclipse experience in 1842 setting up his telescope inside a building at the university in Pavia Italy: “All I wanted was to be left alone during the whole time of the eclipse, being fully persuaded that nothing is so injurious to the making of accurate observations as the intrusion of unnecessary company” (in Weil p.60). Bailey was expressing a concern, common to the singular research scientist, yet remote from the experience of the eclipse festival, for while other humans may disrupt scientific measurements, in the immeasurable landscape of the vibe “company” is critical. And not just your close friends or family, but those others who have also journeyed from far and wide to celebrate the event. And it was this spirit of adventure and diversity - this cosmic vibe - that has carried through to the Ozora of the present, with participants arriving from a multitude of countries, and with the dance floor populated by those speaking many languages – sharing in the experience. And let us not forget where this event, one of the premiere events in contemporary psytrance, is located: in space and time. Just prior to heading to Ozora I found myself attempting to recover from jetlag in Budapest, with the assistance of Botond Vitos, a local researcher of psytrance who graciously hosted me at his apartment a couple of streets from the Danube. On the day before heading to Ozora I found myself wandering around the House of Terror (Terror Háza). More specifically, I found myself standing inside a room in a cellar of the building by this name, where hundreds of people had been murdered at the end of rope on a crude gallows. That device was itself the product of a crude system belonging to the Fascist and Communist regimes who cast their long shadow over Hungary post WWII. Special attention is devoted to the Hungarian Communist regime, one of the harshest dictatorships in Europe. The building is a haunting reminder of the dark manifestation. Both the Nazis and Communists established it as a háza of execution, an infamous house of horrors which operated until 1956, and re-opened in 2002 as a grizzly museum, a memorial to its many victims, and a reminder of the dark potentiality of humankind. One of the macabre aspects of the House of Terror is that it's situated on Andrássy Boulevard, one of Budapest’s main thoroughfares. Indeed you could walk inside the building and choke back on your double cheeseburger as you tour the basement where many hundreds of prominent and relatively unknown Hungarians (some political enemies, others in the wrong place at the wrong time) met unspeakable suffering, endured brutal interrogations and were led, if they survived these tortures, to a cold, miserable, end. A decade after the end of Communism, two hours away, thousands of totality freaks were dancing in the shadow of the moon. It was a new kind of totality, the spirit of which was the polar opposite, if you will, to the tyranny of totalitarianism that had stifled life in the region following WWII. Ten years downstream from that event, I landed in the field of dreams. And, awash in a sound bath of languages – e.g. 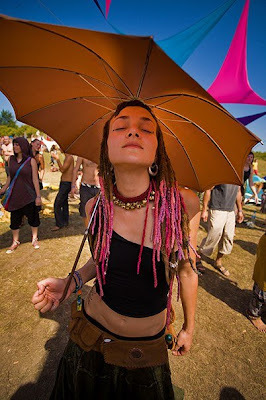 Hungarian, German, Russian, Italian, Swedish, Hebrew, Ukranian, French, Japanese, etc (and of course English of varying inflections) – I was reminded how psychedelic trance is a transnational home to diversity and is a symbol of hope. Many thanks to the photographers including Alex604, Bojan Bilic, Boris Voglar, Dia KL, P. Ekman, Jan Szalkowski, Juan, Sean Vassallo, and Valeria Castellano.